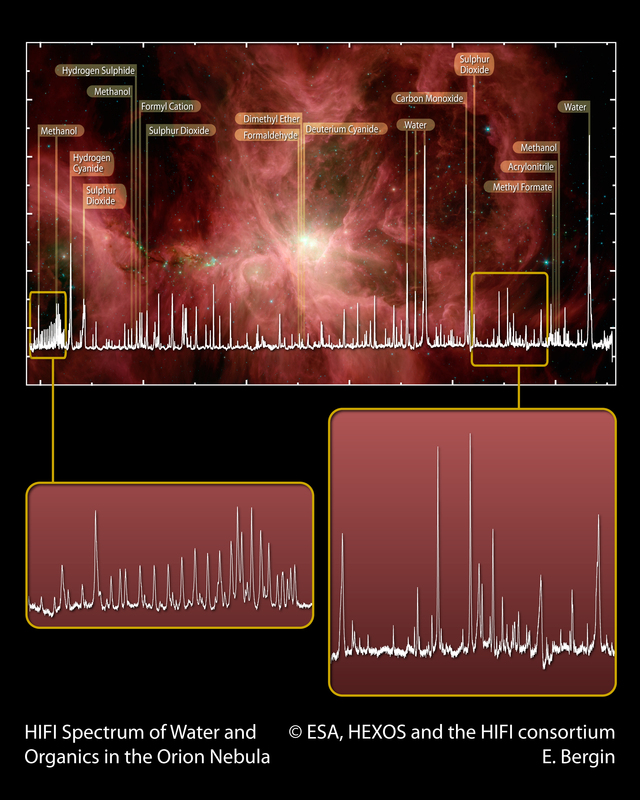 The HIFI spectrum of the Orion Nebula, superimposed on a Spitzer image of Orion. A characteristic feature is the spectral richness: among the organic molecules identified in this spectrum are water, carbon monoxide, formaldehyde, methanol, dimethyl ether, hydrogen cyanide, sulphur oxide, sulphur dioxide and their isotope analogues. It is expected that new molecules will also be identified. This spectrum is the first glimpse at the spectral richness of regions of star and planet formation. It harbours the promise of a deep understanding of the chemistry of space once the complete spectral surveys are available. 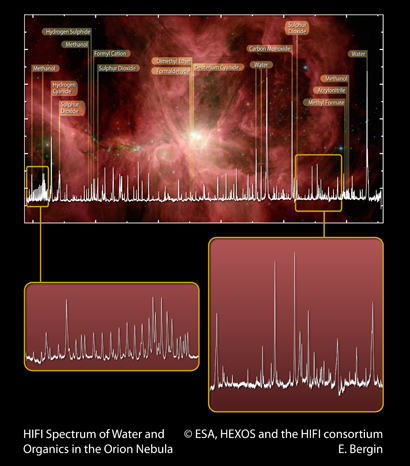 This HIFI spectrum was obtained for the Herschel HEXOS Key Programme – a scientific investigation using the Herschel HIFI and PACS instruments to perform full line surveys of five sources in the Orion and Sagittarius B2 molecular clouds. The scientific rights of these Herschel observations are owned by the HEXOS consortium, led by E. Bergin (University of Michigan).